Updated 5/20/2011 - The USG20 is the entry-level member of ZyXEL's third-generation Unified Security Gateway line. 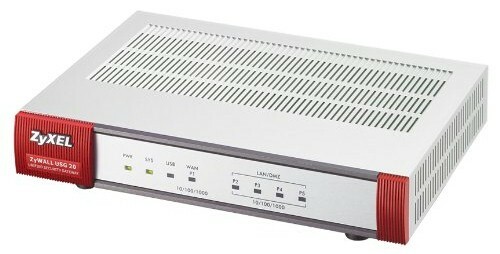 It combines an SPI+NAT firewall, IPsec and SSL VPN gateways, anti-spam and content filtering and multi-WAN connectivity including 3G backup into a security gateway aimed at small businesses with 1-5 users. Unlike its bigger siblings, the USG20 stops short of being a full UTM, because it doesn't include anti-virus or intrusion detection and prevention (IDP). It does, however, have something many lower-cost business routers don't have—Gigabit WAN and LAN ports. The 1-5 user recommendation is based on the USG20's CPU horsepower. But it also is related to the number of VPN tunnels supported, which are one SSL and two IPsec. Updated 4/25/2011 All indicators are on the front and all ports are on the back. Those ports are pretty flexible, too and can be assigned to different subnets (each with separate DHCP server), used as alternate WAN ports or assigned as a dedicated DMZ port. The USB port supports only four Huawai USB 3G cards (E220, E270, E169 and E800), though, making this feature essentially useless for U.S. users. This also makes the failover from WAN to WWAN feature also unable to be used by U.S. buyers. The fan runs very quietly, though and you'll hardly notice it in a quiet home office and would never hear it over the din of a normal office. Devices with part numbers that can be seen include a Realtek RTL8367R 5+1-port Gigabit Ethernet switch, 256 MB of Samsung RAM, Phison PS2232DB flash controller, SMSC USB2313 USB 2.0 3 port hub and Altera EPM240T MAX II CPLD. Flipping the board over reveals two flash devices, 256 MB (Mx 29LV160) and 128 MB (Samsung K9F1G08U0B). Routing throughput running the latest 2.21 (BDQ.2) firmware and our router test process measured around 58 Mbps WAN to LAN and 42 Mbps LAN to WAN. The IxChariot composite plot below shows upload speed drastically lower than download in the simultaneous routing test. The Maximum Simultaneous Connection test and the USG20's firewall didn't seem to get along, since I was able to get only 8 simultaneous sessions after multiple tries. Note that ZyXEL specs 6,000 maximum sessions tested using Ixia's IxLoad test tool. Updated 5/20/2011- Retest of the Maximum Simultaneous Connections with ADP disabled yielded 29,986 sessions. We last looked at a ZyXEL USG back in 2008, with the first-generation USG100. But a lot has changed since then, so we did a full review. You can also test-drive a USG50's admin interface, which is very similar to the USG20's to get a feel for things. You can also compare it to other products using the Router Charts and Router Finder.